Everywhere you turn these days, it seems like someone is talking about decluttering. And with good reason. After a decade (or two or three) in a house, we can accumulate so much stuff! The process of sorting through it all can be overwhelming. This is particularly true for those in the midst of downsizing, which has now become an important part of many people’s retirement. You leave behind the larger home from your work-and-family years and move into a space that’s easier to maintain and to enjoy. But, let’s be honest, the act of decluttering—whether it’s your home or even an aging parent’s home—often falls to the women in a family. That’s why decluttering seemed a perfect theme for this year’s Women’s Wealth Counsel luncheon—an annual event that brings together Truepoint’s female clients to share good food and compelling conversation around a certain topic. At Truepoint, we host events geared toward women throughout the year, and view our commitment to female investors as a source of distinction. In an industry in which 75% of CERTIFIED FINANCIAL PLANNERS™ are men, we take pride that half of our advisors are women. In fact, about half of all of our employees are women. We understand firsthand that women have unique financial planning needs and concerns—like sorting through all the things, including the financial stuff, that we accumulate in our lives. 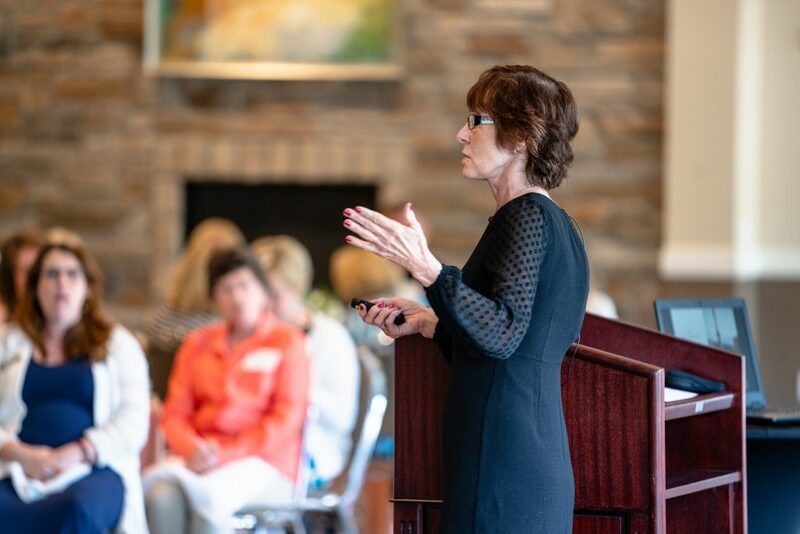 To provide insights on decluttering, we invited Jacquie Denny, Founder and Chief Sales Officer at Everything But The House (EBTH), to speak at this year’s luncheon. She offered pointers on how to declutter, and her amazing staff even provided our clients with complimentary, one-on-one appraisals of their personal treasures! Keep items that have the most value to you personally, regardless of what they’re “worth.” Get rid of any items that don’t match your current taste or lifestyle. Work room by room. Keep what you actually use; donate items in small loads, not all at once, to make it more manageable. Large storage areas, like the garage or basement, can contain your most sellable items. Make “yes” or “no”—not “maybe”—piles! People tend to put everything in the “maybe” pile and don’t make progress. As Jacquie spoke, I was struck by the similarities between her work at EBTH and ours at Truepoint. People often reach out to us during these same times of transition—as they work through downsizing, retirement, or even the death of a loved one. Women, especially, seek trusted financial advice after their husbands’ death. Research shows that about 70% of widows change financial advisors after losing a spouse. These women want an advisor who will listen to them, rather than someone who focused primarily on their husbands. This is a trend we are proud to buck at Truepoint. Our women clients consistently remain with our firm—throughout the many transitions and changes in their lives. This is because we view financial planning as a collaborative, dynamic process, involving both men and women, and because we make it a point to engage with women investors. Our annual luncheon is just one way we connect with women. We also hold social events and educational workshops throughout the year. If you’re interested in learning more about the Women’s Wealth Counsel or working with Truepoint, please reach out to my colleague Chris Carleton or me.